Swiss Cottage, in all its enchanting glory! I’ve always loved the romance and cosy appeal of cottages, and this is a stunning example of ‘cottage ornee’ – a rustic, picturesque building. 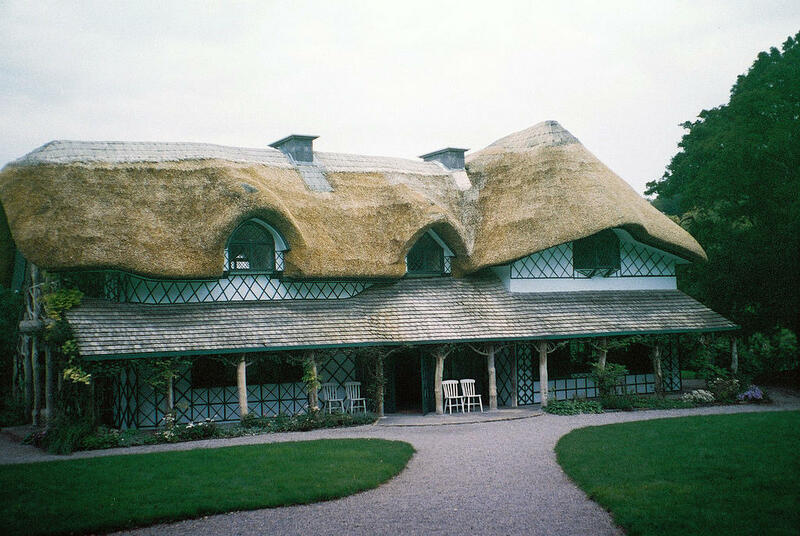 Its thatched roof, branching woodwork and cast iron fencing are typical of the style and lend it a fairy-tale grace. It was built by Richard Butler: first Earl of Glengall, in the early 1800s, to a design by renowned, regency architect: John Nash. What’s most interesting about the history, is that the building was never inhabited by its owners – Lord and Lady Cahir. They never even stopped the night! Instead, they used it for entertaining and while doing so, dressed as peasants (in keeping with the fashions of the time). The salon includes sections of original Dufour Wallpaper, which depicts the city of Istanbul. The flooring is pine and can be seen in the form of a crooked cobweb, in the hall. This is an intentional design feature, which reflects the natural world. The entire cottage defies symmetry and themes of nature continue throughout. The wallpaper in the music room is sprinkled with leaf print and features a thought provoking portrait of Lady Emily. It shows two sides of her – the formal ‘lady’ and the ‘peasant’ who would have spent time at her rustic retreat. The upstairs bedroom is wallpapered in blue and cream with an elegant bird and tree pattern. It includes an original shaving stand and a bed which would have accomodated two people, sitting up. We moved on to Cahir Castle, where we were left to explore the place at our leisure. I was particularly impressed by the head of an extinct Irish elk, on display in the great hall. The model of the castle is also quite complex and has an interactive element, as visitors can press a series of buttons to illuminate certain scenes. The Earl of Essex led a brutal attack on the castle, in 1599 and the model reflects the battle. There are many information boards, detailing the siege and the Earl’s eventual execution, at the hands of Queen Elizabeth. I also enjoyed browsing through text on the lives of women in the middle ages. They did not have a very high life expectancy, (between 30 and 35 years old) mainly due to accidents in childbirth. They were also often forced into marriage. If anyone is particularly interested in this topic, there is a programme showing on BBC 4 tonight at 9pm – ‘Medieval Lives: Birth, Marriage, Death.’ I find BBC 4 is very good for documentaries. I watched ‘Pain, Pus and Poison’ from behind a cushion, last night. My verdict? Horrific, surprising & fascinating. Watch if you dare!